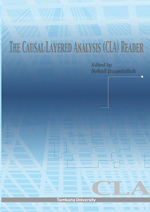 The Causal Layered Analysis (CLA) Reader: Theory and Case Studies of an Integrative and Transformative Methodology Edited by Sohail Inayatullah Tapei, Tamkang University Press, 2004. 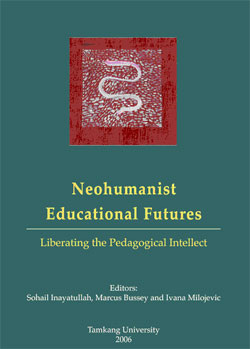 Neohumanist Educational Futures: Liberating the Pedagogical Intellect Edited by Sohail Inayatullah, Marcus Bussey and Ivana Milojević Tapei, Tamkang University Press, 2008. Macrohistory and Macrohistorians: Perspectives on Individual, Social and Civilizational Change. Edited by Johan Galtung and Sohail Inayatullah Westport, Connecticut, London, Praeger, 1997. 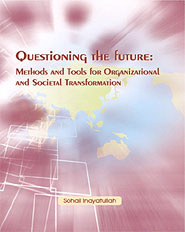 Questioning The Future: Methods and Tools for Organizational and Societal Transformation Sohail Inayatullah Taipei, Tamkang University Press, 2007. Read first 30 pages of Breathing: Violence In, Peace Out here: Introduction. Understanding Sarkar The Indian Episteme, Macrohistory and Transformative Knowledge Sohail Inayatullah Leiden, Brill, 2001.